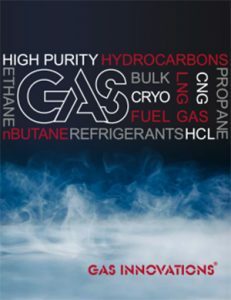 HOUSTON (August 05, 2015) – To support burgeoning hydrocarbon refrigerant markets, Gas Innovations® has expanded its capability to supply refrigerant gases to LNG and FLNG liquefaction plants worldwide. The unprecedented economic success of U.S. shale gas has created seemingly unending ripples for numerous industries – and economies – across the globe. For Gas Innovations, one of only two companies in North America solely focused on purifying and packaging hydrocarbon, specialty gas and welding consumable products, the significant cost advantages to producing natural gas have resulted in the ability to produce and package great quantities of ethylene. The assurance of supply for this key refrigerant in making cryogenic natural gas has greatly increased the ease with which natural gas producers across the globe can liquefy and then transport their own feedstock supplies. Gas Innovations has added a third bulk storage tank at its Texas facility, increasing its storage capacity from 12,000 to more than 27,000 gallons. This increased inventory allows the company to fill six ocean-going ISO containers with on-site volume, alone. And the enhanced storage at its facility is already being utilized to address large-scale needs. The company is currently in the midst of a project to load 25 5,000-gallon liquid ISOs of ethylene to ship to Africa, where an effort is underway to restart a LNG plant there. They are also concurrently servicing a large project in Australia, supplying sufficient quantities of ethane to start up a massive plant that will liquefy and ready for transport the significant stores of native natural gas. This project, in turn, will make shipment of LNG to Japan – as one answer to that country’s energy woes – more economically viable. Gas Innovations was founded in 2002 with the goal of providing industrial gas producers and distributors a dependable, independent wholesale supply partner. Since its founding, the company has grown to become a leading supplier of high purity hydrocarbons, propylene, propane, and specialty gases, along with a complete line of cutting, heating and Kobelco welding consumables. Additional services include world-class ultrasonic UE 5 cylinder testing, cylinder packs and related cylinder services and sales. Gas Innovations is strategically located at the mouth of the Houston Ship Channel in La Porte, TX. For more information, please visit www.gasinnovations.com. Download this press releases here.